Still seeking the identity of Savitar, Barry makes a desperate trip to the future. Arriving in 2024, he discovers his friends - and himself - changed into drastically different people in the wake of Iris' death and a Central City ruled by metahuman criminals! Can Barry become the hero the future needs? The Flash: Terminal Velocity by Mark Waid (The Flash tries to save the life of the woman he loves following a trip to the future when he learns of her death) and the Fast Forward episode of the 1990 The Flash series (base plot of The Flash going forward in time and seeing everyone he knows and loves changed for the worst.). Isn't it a bit odd that Iris asks Barry to promise to watch after Joe if she dies but not Wally? How the heck did Caitlin get out of the STAR Labs building faster than Barry could search it? Granting that it's necessary - from a storytelling perspective - for Future Barry to be given a reason to come out of retirement and save his past self (apart from simple self-preservation) Barry slowing down to taunt Mirror Master and The Top and giving them time to use their powers is phenomenally stupid. When Future Barry tells his past self about Tracy Brand and The Speed Force Trap, he says that she didn't figure out the technology until "four years ago." Barry says this was four years after Iris died. Actually, it would be three years after Iris died. Later, Barry says he went eight years into the future. It was seven. Technically a little less, assuming he left March/April 2017 and arrived in February 2024. So... what happened to Jesse Quick in all of this? Did she ever come back from Earth Three? The idea of Caitlin suddenly developing an evil persona because of her powers has been one of the weakest ideas in the show's mythology but damned if Danielle Panabaker doesn't sell it for everything it's worth in this episode as the future Killer Frost. The scene of Barry getting ready to run back to the future and then stopping is a great bit of non-verbal acting on Grant Gustin's part. Even with his face half-hidden by his mask, you can see everything Barry is thinking in his eyes. For that matter, Grant Gustin almost seems like another actor as Future Barry. More impressively, he does that deep "dark hero" voice and doesn't sound completely ridiculous while doing it. The use of a darker tint and a grayer color palette in the scenes set in the future help to visually distinguish those scenes from the scenes set in the present. It's a striking choice, visually. The production design is fantastic all around, with a STAR Labs of the future set that is virtually unrecognizable it is so ruined and disheveled. Tom Cavanagh does a fantastic job on the direction in this episode, coaching his fellow actors into delivering some of their best performances to date. The episode title is taken from The Once And Future King by T.H. White. This episode was directed by actor Tom Cavanagh, who plays all the various versions of Harrison Wells. While there are several The Flash comics based around dark futures that The Flash travels to and then tries to avert, the plot of this episode is oddly close to that of Fast Forward - an episode of the 1990 The Flash TV series. In that episode, Barry Allen accidentally runs ten years into the future while trying to stop a missile and discovers that the villain who launched the missile has become mayor of Central City in his absence. Barry's allies have been changed by his apparent disappearance, growing cynical and hopeless in his absence. Much the same thing happens here, though Barry didn't disappear from the timestream completely. Curiously, this episode originally aired on April 25, 2017 - seven years to the day before Barry is meant to vanish, according to the future newspaper first seen in the pilot episode. Iris' birthday, according to her tombstone, is June 24, 1989. Candice Patton, who plays Iris West, was born on June 24, 1988. The costume worn by Future Barry is a brighter shade of red than the one worn by the 2017 Flash. Indeed, it closely resembles the traditional Flash costume from the comics, with a prominent gold-colored belt that is shaped like a lighting bolt and brighter gold lighting insignia on the arms and boot tops. Still no yellow boots, alas. Barry calculates the force of the explosion that propelled him into the future. Wally can generate three-times that amount of force at his top speed - more than enough to send Barry seven years into the future. Future Cisco creates a device that disrupts the resonance field that Barry generates when he runs. This prevents him from opening a time portal back to 2017. Future Cisco later alters this device to mimic the resonance fields of Mirror Master's portals. This will allow Barry to manipulate the mirror portals as well and restore the refraction effect caused by The Top's powers. Future Barry: Why are you here? Barry: I need your help. Future Barry: You're from before she dies, aren't you? Future Barry: You can't save her. Barry: Yes, I can! And I'm going to! Future Barry: No, you can't. Go home. Barry: Just tell me who is in the suit! Barry: All right? That's all I need. You tell me that, we'll be able to track him down! We'll learn his weakness! We... we'll stop him before he even tries. Just tell me who Savitar is. Barry: What do you- ? Why?! Future Barry: (sighs) Because I don't know the answer. (pauses) Sorry you ran all this way for nothing. You want some advice? Go home. Spend as much time with Iris as you can. Because pretty soon... we're never gonna see her again. Killer Frost: From the past? I can tell. There's no hate in your eyes... yet. So to what do we owe the pleasure of your visit? Come to see how things turn out for Team Flash? Barry: I wanted to see what happened to my friend. Killer Frost: I am NOT your friend, Flash. Barry: I'm so sorry I did this to you. I should have saved you. Killer Frost: I'm GLAD that you did this to me. Barry: Caitlin wasn't. (pauses) I failed her. But I won't when I go back! I'm going to find you and I'm going to help you! Killer Frost: (scornfully) You're no match for The God of Speed! Killer Frost: Ohhhh... you didn't tell him, did you? Barry: Why would you help him?! Killer Frost: Because he gave me the thing that you couldn't! The cure to my illness? Embracing who I really am! Barry: You know who he is. Barry: (leaning in closer to the glass) Tell me who he is. Future Joe: Why are you here, Barry? Barry: (taken aback) I just wanted to see you... I just wanted to see how you were doing? Future Joe: NOW you want to know? After all this time? Now? Future Joe: I'm doing my best. Barry: What happened to us? Future Joe: My daughter's life was taken. My son's. And then you left me Barry. The last piece of who I was... left. Turned his back and ran away. Barry: (stunned) I wasn't there for you?! Future Joe: Why start now? (pause) I'm gonna need you to leave Barry.... please. Future Barry: You want answers, Barry?! How's this? You will go back. You will do everything that you can think of to save her. You're even going to create time remnants of yourself, but he's going to kill them all, mostly! And then on the night of May 23rd, Iris West will die in your arms. Future Barry: There will be nothing left at all but stopping Savitar. So no - you won't be there for Joe. You won't be there when Caitlin becomes Killer Frost. When Savitar destroys Wally... You won't be there for any of them. But then one day you'll stop him. You'll lock him in The Speed Force forever. But at that point... he already won. Because everything that you've ever loved is gone. Including you. (pauses) Go home, Barry. There's nothing for you here. Barry: Why would you keep me here? Future Cisco: Because I miss my friend. Future Cisco: If you want to go, I'm not going to stop you. I don't know why I expected you to be the same Barry Allen I remembered. That guy still had some fight left in him. Future HR: Continuing with the HR Romance Series, "The Streak Vs. Mr. Reflecto"... "Just as the villain was about to go in for the fatal blow, Florence felt strong hands around her waist... lifting her, like she was a feather." (makes a wind rushing noise) "She was whisked away, the wind blowing through her hair, as her mystery hero finally set Florence down on a mountain top." HR: I love that part. I was in the zone. HR: Ah-ha. She - uh... Florence, was ah, um... and the mountain top! Back to the mountain top! Mirror Master: Baby, you're a rock star! The Top: Just like to shine for my man. The Flash: Yeah, I don't know. It looks a little... tacky from over here. But... I am old-fashioned. The Top: We told you to stay away, Flash. The Flash: Yeah, well I try not to listen to criminals. Or stupid people. Savitar: I've been waiting for you. Savitar: Fear not, my child. I've come only to offer you what you desire. Killer Frost: And what's that? Killer Frost: You want to cure me? Turn be back into Caitlin Snow? Savitar: No. I want to make sure that Caitlin never returns. Killer Frost: Why should I trust you? Killer Frost: What do you need me to do? The song "Swing Low, Sweet Chariot" is apparently the same on Earth 19 as it is on Earth One. Barry travels to February 3rd, 2024. This is a little under three months before the future newspaper first seen in 101 which reported The Flash vanishing during a crisis on April 25, 2024. Mirror Master and The Top are seen for the first time since 304. Mirror Master and The Top both remark that they haven't seen The Flash in a while or seen him wearing "that particular costume". They also claim to own Central City now. It is later revealed that at some point in The Future, Barry switches to a bright red costume with a more prominent gold belt that is shaped like a lightning bolt and more prominent gold lightning symbols on his sleeves and boot-tops. Future Cisco seeks out Barry, having had "a feeling" he was around. He apparently has no memory of Barry traveling to the future from 2017. In 2024, STAR Labs is shut down. Future Cisco says that Future Barry pushed everyone away. Future HR Wells went on to "other things" besides running The STAR Labs Museum. Future Caitlin never set foot in STAR Labs again after becoming Killer Frost. Future Barry lives inside the ruins of STAR Labs, rarely leaving. 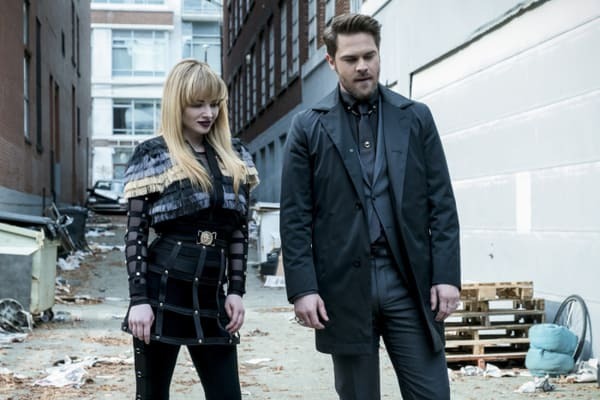 We see a bit more of the future fight between Killer Frost and Vibe from 306. Future Cisco lost his hands and his powers after a battle with Killer Frost as Vibe. He has mechanical prosthetics but he cannot channel vibes through them. Future Julian Albert is in the employ of Iron Heights prison. Future Caitlin Snow has given herself over completely to her Killer Frost persona. She is incarcerated in a special cell, overseen by Julian Albert. She confirms that she came to work with Savitar after he gave her what Barry couldn't - peace with who she was rather than a cure for her powers. She also says that she knows who Savitar is but that she will never tell him. Future Wally West is confined to a wheelchair and in a perpetual state of shock, cared for by a nurse named Beth. Reportedly, he went into a rage after Iris died and went after Savitar by himself. Joe reportedly found him the next day, completely unresponsive, with a broken spine. Iris' birthday, according to her tombstone, is June 24, 1989. Future Joe West is a broken man, who never leaves his home except to place fresh flowers on Iris West's grave. According to Joe, Future Barry abandoned him after Iris's death and Wally's paralysis and the last piece of who Joe was died when his son ran out on him. Future Barry says he was able to trap Savitar in The Speed Force forever but by the time he did it it hardly mattered because Savitar had destroyed everything that he loved. He also never found out who Savitar had been. Future HR has apparently bought CC Jitters and renamed it HR Jitters. He is a successful science-fiction romance novelist, who is engaged in a live reading of his book The Streak Vs. Mr.Reflecto when Barry retrieves him to rejoin Team Flash. Until two Flashes appeared to recapture The Top and Mirror Master, The Flash hadn't been seen in Central City for years. Future Barry reveals that he had help trapping Savitar. He utilized a Speed Force Trap designed by a physicist named Tracy Brand. He didn't tell Barry this because the technology wasn't perfected until four years earlier. Future Barry gives Barry a media storage device that has all of Tracy Brand's information on it. Future Barry says he doesn't understand anything on it and that he doesn't know where she is, but maybe Barry can use it to find her. Future Barry tells his past self about how he trapped Savitar with the help of a physicist named Tracy Brand. Again, Iris has nothing to do but be the trophy girlfriend/daughter/sister to be saved. Again, it's troublesome that the one main female member of the cast to develop superpowers is driven evil because of them. Easily the best episode of the season. One of the best episodes of the show, without question. The script is weak and rife with plotholes but the character-work and direction save it. Hopefully Tom Cavanagh will get to direct more episodes in the future because he gets some great performances out of his fellow actors. The show's treatment of Caitlin is still problematic but at least she's shown to be a figure of power... even when locked up in a prison cell.